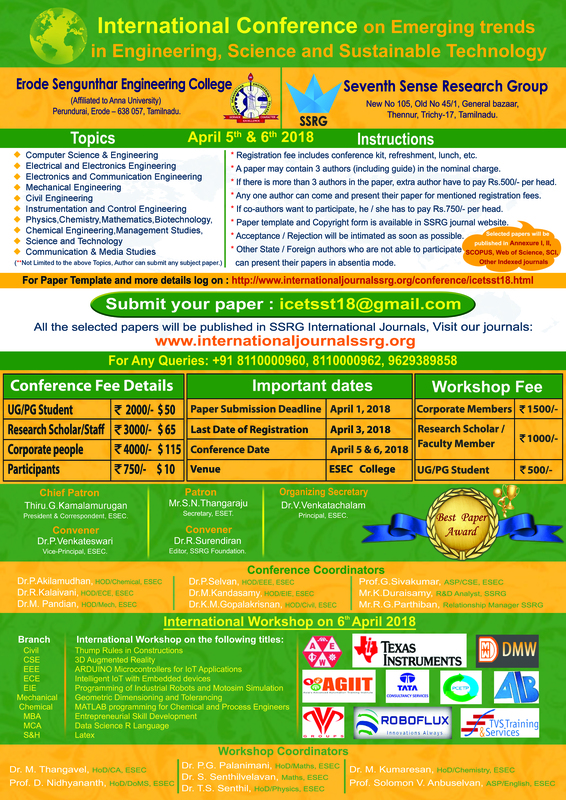 ssrg International Conference on Emerging trends in Engineering, Science and Sustainable Technology(ICETSST-2018) Erode Sengunthar Engineering College, Erode, India. The aim of ICETSST-2018 is to bring the research domains in mathematics and information technology on a single platform. This conference will bring the research communities of different fields together at one place to share their research and ideas. The main purpose of this conference is to incorporate interdisciplinary research to bring out best applications. Sangameshwarar Temple, Bhavani is about 15 kms. from Erode. Confluence of three rivers by name Cauvery, Bhavani and invisible Amudha at this pilgrimage place and termed as Mukkoodal. 2) Chennimalai - is about 30 kms. from Erode and 12 kms from Perundurai. Bannari Amman Temple is 75 kms away from Erode and 10 kms distance from Sathyamangalam. It is the famous temple in Erode District and situated at the bottom of the Western Ghats on the way to Mysore. 1. Bhavanisagar Dam is about 16 kms. from Sathyamangalam across the river Bhavani. 2. Kodiveri Dam is about 10 kms from Gobichettipalayam and 55 kms from Erode. Dakshinamurthi Statue in Museum - 12th Century AD. Address: Curator, Government Museum, Municipal Office Campus, Erode – 638 001. The Museum was opened to the public in 1987. The important exhibits are inscription of Kongu Chola, hero stones from Bargur, Tanjore paintings, manuscripts, coins, geological objects, Kodumanal antiques and other pre-history items. It has both botanical and zoological specimens also. The Museum is known for its collection of palm-leaf manuscripts and coins. Birds Sanctuary, Vellode is about 15 kms from Erode.